This update stinks. First there was the battery drain and google maps updating itself every 5 minutes. Now i can't download and install anything from google play!! I should clarify. I can download apps using mobile data but wifi does not work to download. Makes know sense. My wifi connection works because i can surf the internet with my phone. Unbelievable. Sorry to hear the folks, I'm pretty happy, no issues here except contact pictures disappeared from messaging app, which doesn't bug me. For Google maps, uncheck keep location history from maps settings, it will not affect any features since latitude doesn't exist anymore. So I did a factory reset yesterday which resolved contact picture in msg issue. 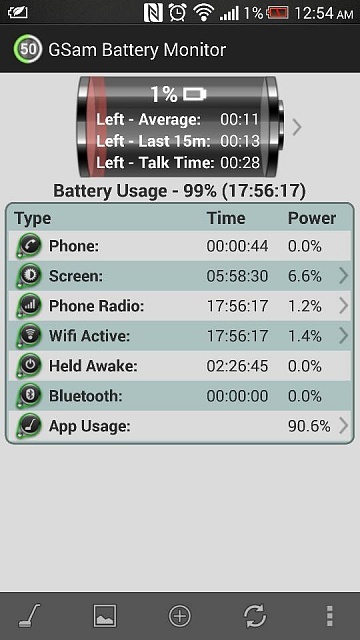 Also seeing an improvement in battery life.. I haven't had one single problem since I updated my phone. But I did not do it over the air. I went to the HTC.com/us and selected AT&T and Updated that way after downloading the file. Battery life is awesome! I'm having the pictures disappear in message app also...battery was draining also..I think because something kept syncing..looked like Google back up.. I unchecked alot of unnecessary stuff....now phone isn't syncing as much...so battery life is better..I'm alitte upset theres bugs in this update. I wouldn't say bugs in the update, it was complete Rom upgrade, while they try to retain your apps and setting, minor glitches occur as a side effect. Which usually gets cleared with a fresh start/factory reset. If it was a bug in the update, I hard reset would not fix it. Same for me. No issues. I did fresh install route like you. I've done 2 factory resets and still have glitches. Mostly the contacts disappearing / reappearing in the messaging app. Another is that about every 3rd restart, the widgets on my home screens disappear and I have to re add them. Although I will say that after the first FR, my batt life has improved somewhat. I am seeing better battery life with 4.3. I had a problem after the update with my music player (Beats as well as PowerAmp paid) playing each song twice. Turned out to be something in the way 4.3 uses the file tree. Checking my music folder only once solved this issue. 4.3 The only other issue that I have seen is with the proximity sensor. Last night I completed a call and when I moved the phone away from my face the screen would not come on. I had to push the power button at top of phone then end the call. But my next call worked fine. I had read that the proximity sensor issue is new with 4.3. Other than those two issues I am loving 4.3. And I certainly love my HTC One! After I first updated to 4.3 I had a battery drain issue. However, after doing a factory reset. My battery life is much, much better than when I was on 4.1.2. And my phone feels snappier. I too have found my HTC One proxmity sensor is not working properly since the 4.3 update. I did a factory reset and it appeared to fix it for a few days but the issue returned. Currently the phone is pretty impossible to use to make calls as just having the phone near my head causes buttons on the screen to get activated due to the screen not switching off. Very very frustrated as prior to this update everything was working perfectly. Galaxy S4 - Battery life on update?